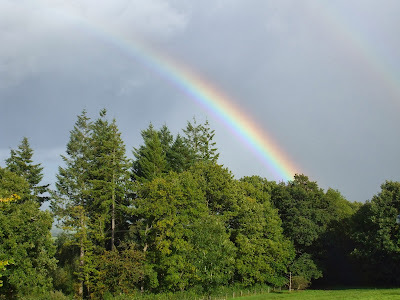 My friend Cloister recently spent a few days in Yorkshire, where she was blessed with seven rainbows, or as she called them, seven rays of hope. I can understand her delight, as I recall how I felt during my retreat in September, when I saw two rainbows within an hour of each other (or maybe three - the second one had the faint shades of another rainbow above it). God's eternal covenant, and promise of new life, twice within an hour on the first day of my retreat - that was something special! The second rainbow began (or ended?) in a field only about 100 yards from my hermitage. I felt as though I could run down there, stretch out my hand and touch the translucence shimmering its way into the ground. But of course, the mystery and fascination of rainbows is that we can never see where they begin or end; we simply see them floating above us, arching into the sky, somehow, somewhere, linking heaven and earth. And so, although I could see this rainbow's end (or beginning?) so clearly, right in front of those trees, I couldn't capture it on camera; that has remained its elusive secret - though one I was briefly privileged to share.